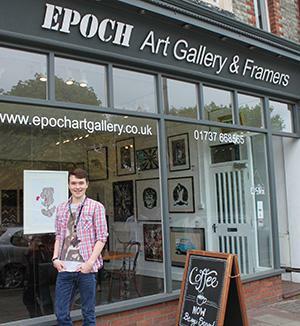 Level 3 Art & Design student Oliver had his winning artwork framed and displayed in the Epoch Art Gallery’s window in Redhill. The Extended Diploma in Art and Design students visited the Gallery to find out about the commercial aspects of running a gallery, different materials and artists' work. The College arranged a live project brief with the Epoch Art Gallery entitled ‘Who are You’. Students were asked to explore techniques and processes from the Gallery visit and apply them to their work.